The delay of Nigeria’s election has generated international concern for the country’s fragile democracy as the current Nigerian administration cites the terrorist group, Boko Haram, as the reason for the delay. The election that was originally supposed to occur on February 14 has now been postponed to March 28th because Boko Haram has threatened to attack the polls if the election is held. Although the threat might be real and dangerous, many feel that it is a ploy by current president, Goodluck Johnathan, to hold onto his power as he faces fierce competition in this election, and might actually lose the presidency. His opponent, Muhammadu Buhari, a reformed former dictator, has a strong chance of beating him at the polls. He states that this postponing only helps the President as the security threat hasn’t changed in the past two weeks. Western leaders are also disappointed at Nigeria’s sudden decision. US State Secretary, John Kerry, has stated that politics should not be the reason for delaying the election. Philip Hammond, Britain’s Secretary of State for Foreign and Commonwealth Affairs, condemned the decision, noting that the decision denies Nigerian citizens to exercise their right to vote, and that the security threat should not be a reason for impeding the democratic process. But the security threat is a legitimate one as Boko Haram has made clear; the group’s violent activities have increased in the Northeast in recent months. Although an international military force of 8,000 troops has been called into Nigeria to help erase this radical Islamist group, it hasn’t been able to deter the group from causing violence in Nigeria. Nigeria’s military has unsophisticated weapons that are no match for Boko Haram’s. The military also has to deal with corruption among the leaders which does not help achieve its main goal. Nigeria is also under great international pressure to eradicate this group as the group’s violence and ideology have spilled into neighbouring countries of Cameroon and Chad. Standard & Poor, the international financial institution, is considering downgrading the country’s currency, naira, due to the Islamist uprising in the country. 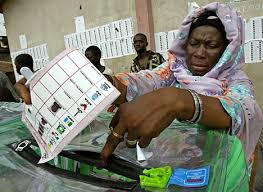 The last day that the election has to be held is on May 29 as Nigeria’s constitution mandates. Time will only tell whether the current president will abide by this and let Nigeria’s democracy, which has only been instated since 1999, continue.